Remember when I told you we thought my daughter's pet rabbit (practice for meat rabbits here on the homestead) was pregnant? We mated the doe, and she immediately started showing signs of pregnancy, including moodiness (which is not like her), beating up the buck she usually adores, making a nest, and pulling fur to line her nest. All normal stuff for a rabbit about to give birth. Well...her proper gestation period is far and away over and we still don't have kits. Our rabbit had a false pregnancy. Scientists really don't understand why false pregnancies (also called a phantom pregnancies, hysterical pregnancies, or - more correctly - pseudocyesis in humans and pseudopregnancy in other mammals) happen, but they speculate it might be all about the mind: The mammal thinks she is pregnant, and that belief changes her hormones, making her body show signs of pregnancy. It's difficult to identify false pregnancies, since you cannot judge by outward behavior or physical appearance. Because the animal's hormones are altered, blood tests may come back positive when experiencing a pseudopregnancy. Patience, or an ultrasound, are the only sure ways to determine if a pregnancy is real. If you have, say, a goat that appears pregnant but is not, you could waste months waiting for kids that never appear. While this may not be a big deal on a farm of larger scale, it can really hurt the small-scale homesteader. So is there a way to end a false pregnancy once it's begun? Unfortunately, mammals are not like broody hens that you can help "snap out of motherhood" by enforcing a "cooling off period." (Learn how to do that here.) The Merrick Veterinary Manual says sometimes tranquilizers are effective in treating a false pregnancy, or perhaps a dose of progesterone. But in almost all cases, time is considered the best medicine. Put on your patience cap! In many cases, the animal cannot be effectively bred until she is over her pseudopregnancy. 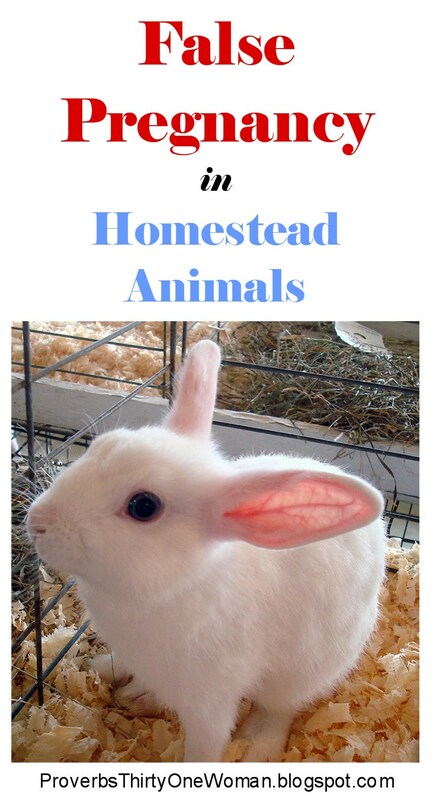 Click over to MediRabbit for more information about false pregnancies in rabbits. Cover image courtesy of Sean.